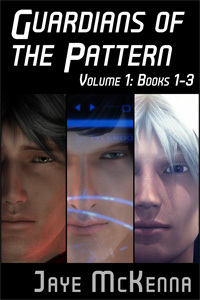 Coming on December 14 is Guardians of the Pattern, Volume 1, a digital bundle that includes the prequel story, Facing the Mirror, plus the first three novels of the Guardians of the Pattern series: Psi Hunter, Gremlin's Last Run, and Ghost in the Mythe. That's over 320,000 words of sci fi goodness to kick back with over the holidays. Facing the Mirror (Prequel): When undercover agent Cameron Asada meets Miko, a psychic slave kept by the drug lord Cameron is investigating, he starts to question his mission priorities. The choice is clear: complete the mission or help Miko. Neither option is easy, but only one will allow Cameron to face himself in the mirror. Psi Hunter (Book 1): Sparks fly when ex-lovers Kyn Valdari and Pat Cottrell are ordered to team up on a murder investigation. When they discover an abused, traumatized young psion powerful enough to kill with a thought, they must work together to protect him from being enslaved by the very organization that is supposed to save him. Gremlin’s Last Run (Book 2): When independent freighter captain Rhys Tyler finds Alek McKinnon hiding in his cargo hold, he has a choice to make: help a wounded Federation agent escape from his captors, or shove him out the air lock. One look at Alek’s pretty brown eyes is all it takes to convince Rhys to take a chance on the man. Now they’re both on the run from a shady organization that wants Alek back at any cost. Ghost in the Mythe (Book 3): Exiled from his home world, Tarrin Rhivana stows away on a Federation ship, and finds himself lost in the terrifying place-between-worlds where jump ships navigate. There he meets a beautiful ghost who might be the only one who can help Tarrin save his world from outside forces that would strip it bare.